A beachtown in October is a haunted thing. Umbrellas folded and lounge chairs stacked, soda machines unplugged and a chilled air of desolation—packed up and shut down, another season over, as the clouds thicken and the waters dull. Ulcinj is as mangy and lazy as a street dog. It has the restless wind of a border town, which in a way it is. 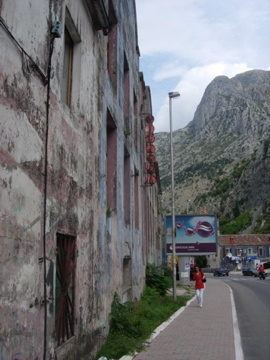 Thirty-some minutes from the Albanian border, the town’s population is 80% Albanian, 80% Muslim. 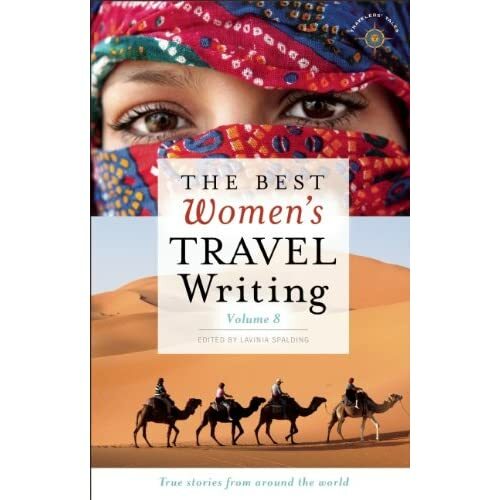 I didn’t realize what a sharp difference that would be until I got here, heard the ghostly adhans echoing from minarets, passed old women with white scarves over their heads, saw the men sitting crosslegged at cafe tables. And garbage—garbage everywhere, skinny stray cats stalking through the mess. 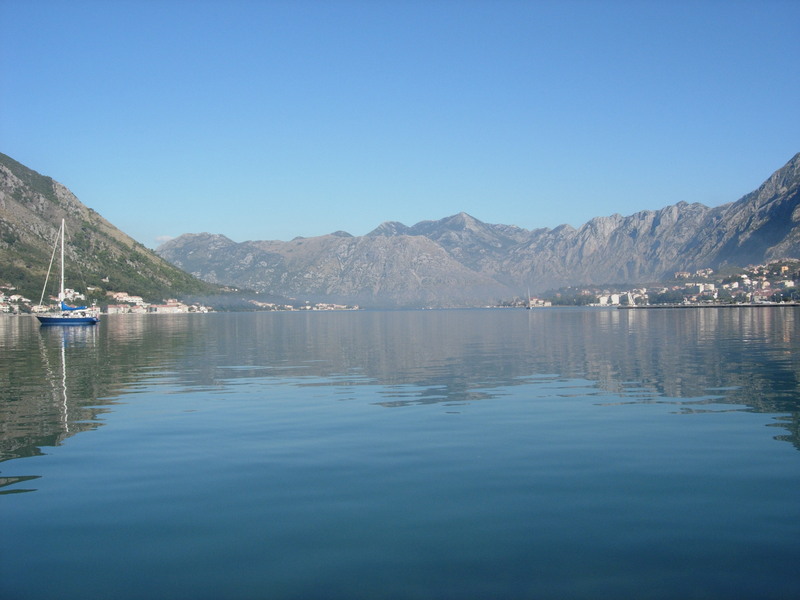 There are no gleaming ads for Montenegro tourism, no English restaurant menus, no cruise ship docks. The former pirates’ cove is run-down and dirty, filled with the buzz of flies and the smoke of kebab shops, bazars of cheap jewlery and beach blankets. “It’s political,” the man who runs the guesthouse tells me. 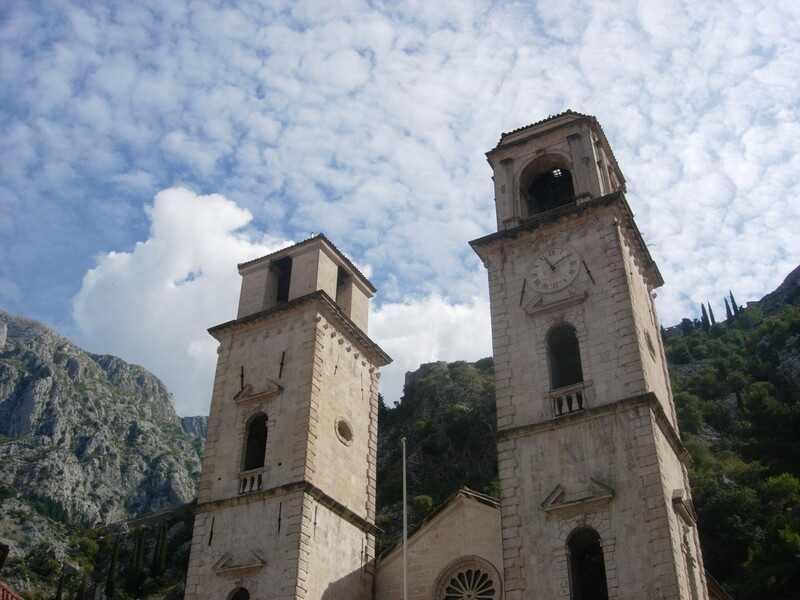 “The investment, it goes up to Budva, Bar, Kotor. 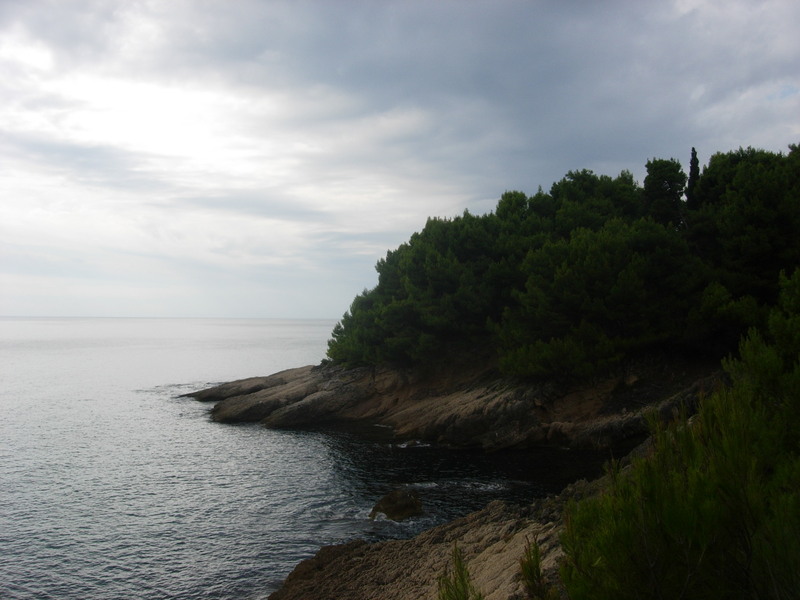 Ulcinj is…” He brushes his hands in a dismissive manner. “No, no,” the Ulcinj guesthouse keeper sighs. “Is long history. But Ulcinj, tourism now is…” he makes a downward motion with his hand, like a line chart dropped, or an airplane crashing. Maybe that’s why it felt especially desolate as I walked around today. The weather changed today—late summer is gone and autumn has arrived, clouds and cool air, the fitfulness of something escaping. Most of the shops were closed, the streets near the coast empty. 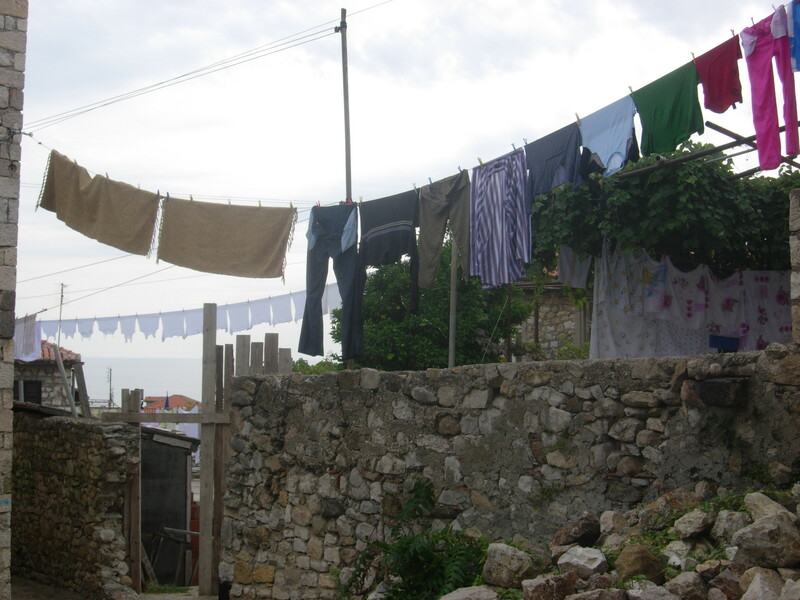 I wandered through the old town, a ghost town of stone and trash, laundry lines and the soft sound of voices floating out of windows—my own private Ulcinj. It wasn’t just that the season had ended; there was a weightier sense of abandonment, disrepair. 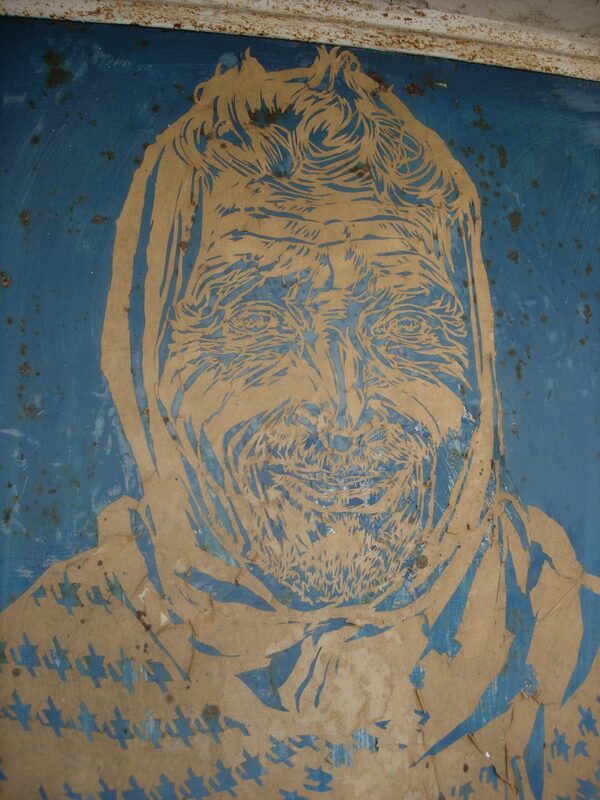 A man with the face of a Swoon woodcut pauses as he passes me. He doesn’t seem to be going anywhere in particular, and he starts chatting with me, as Montenegrin men will do, not letting the language barrier get in his way. It’s always a sincere and entirely unsleezy exchange; they want to know where I’m from, if I like their country. I can’t follow much of what he’s telling me, so instead I watch the deep lines in his face, an impossible etching of sun and time. 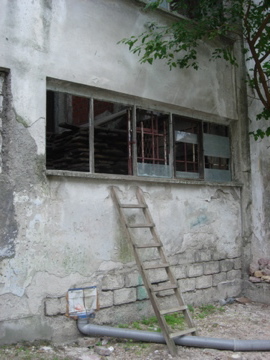 He is a fisherman and his doctor, no, his daughter, lives in Tirana. He hasn’t seen her in 5 years—he counts them on his fingers, slowly, tenderly. He gives me a big smile, front teeth missing and the others just thin little slits. He pats me on the shoulder, says “thank you,” though I’m not sure why. 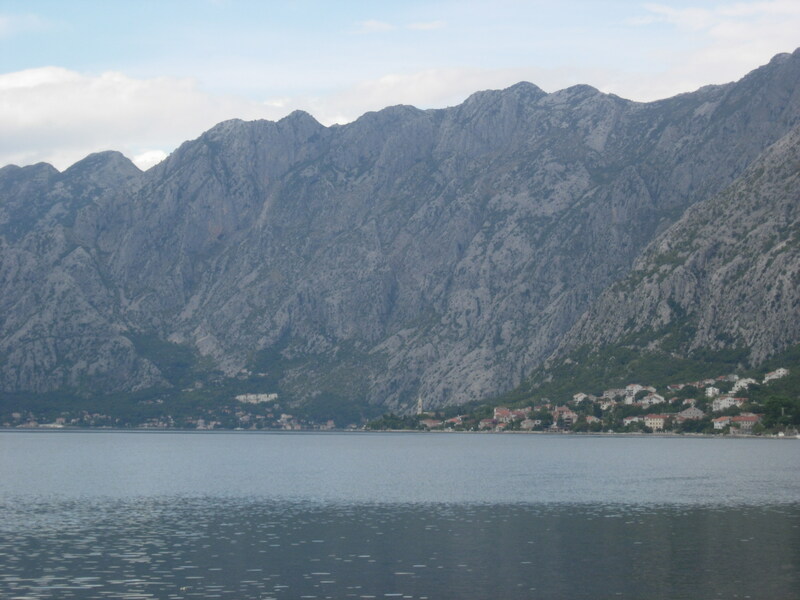 “Hvala,” I reply, my one word of Montenegrin. I wander out of the stone arch of the old town, and wonder if he was a ghost. I walk along the coast, and it’s an endless string on rocky coves, rubbish falling from the cliffs like weeds or rocks. The cement sun decks are all fenced off, locked up, an amusement park at night. I continue, go deeper, through a sponge of dead leaves and dirt, picturing the sun, the gleam of tan bodies—imagining being here, walking, with someone I love, picnic packed and towel-clutching. But, no, I’m alone, with the grey and the wind. Maybe the guesthouse keeper is right—maybe in 5, 10 years, Ulcinj tourism will come back, go up again, the hopeful angle of his climbing hand. But for now, for today, it’s a spooky little place to spend a day. 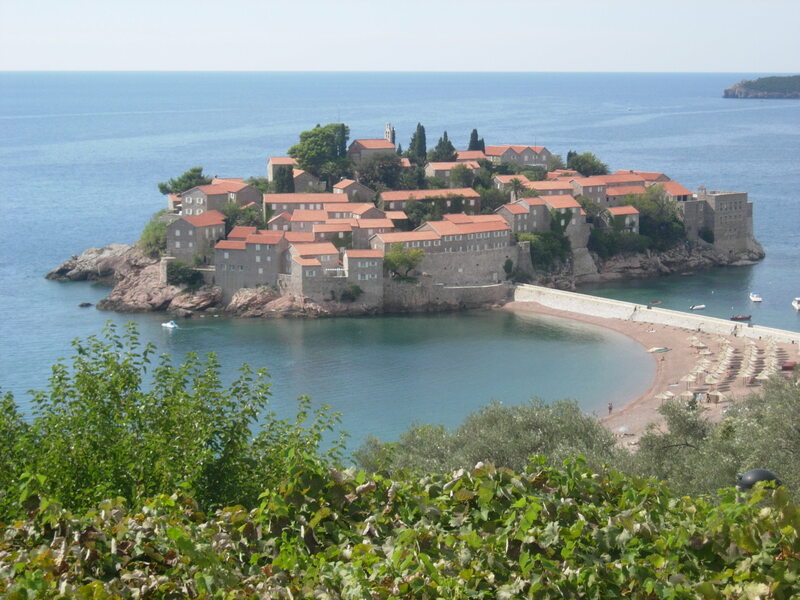 In a little cove on the Montenegro coast, cleaved between staggers of rock and water clear as glass, I’ve discovered what is simultaneously the most beautiful and depressing place I’ve never been: Sveti Stefan. 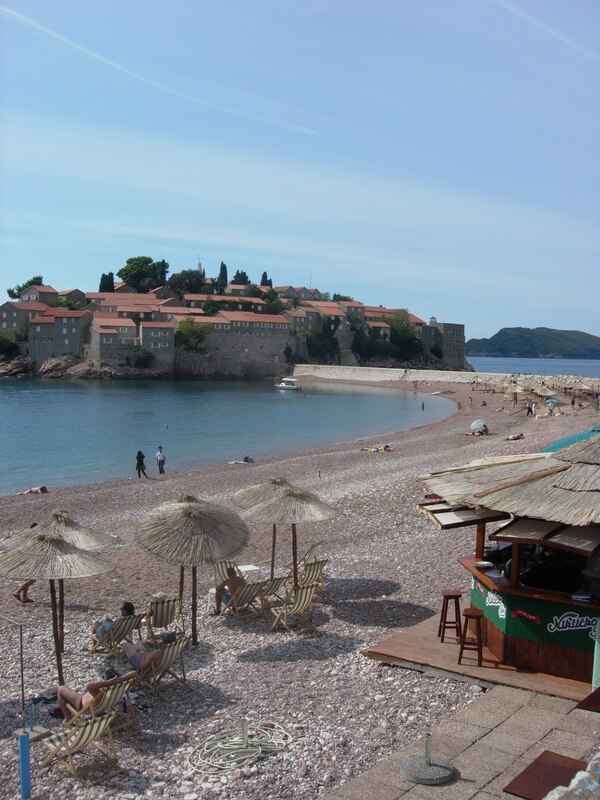 A little jumble of terracotta roofs, grey stone buildings that look like they were carved right out the rock, a couple trees poking through, all sitting plump and pretty and perfect in that glittering, glittering water: what could be more picturesque? So you take pictures. Lots of them. You see the other vacationers—Eastern Europeans and a handful of Italians—doing the same. You’ll go over, have a stroll, feel the old cobbled stones through your soles, soak in the Old World ambiance before you work on that sunburn you’ve been itching for. Only you can’t. 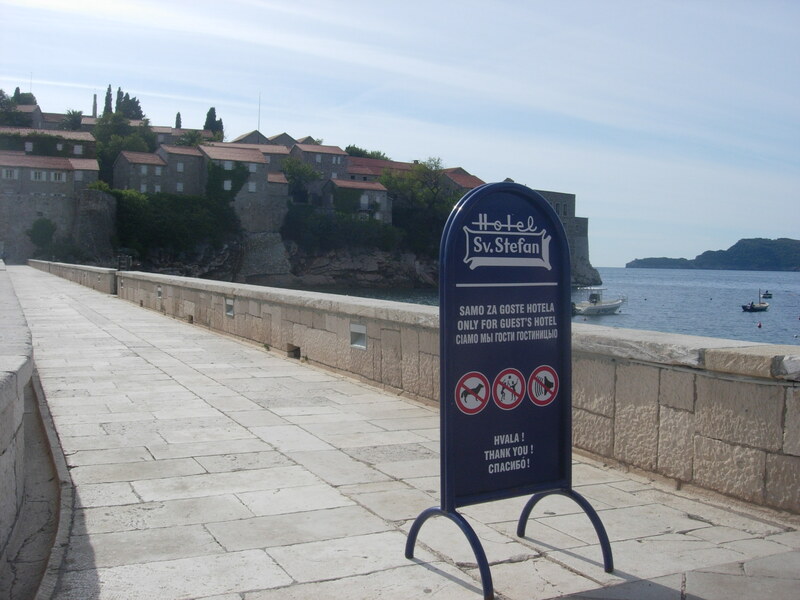 You can’t actually go in Sveti Stefan. On the narrow isthmus leading up to the island—made of sand and reinforced with a stone-wall walkway—there’s a sign telling you you can’t. And a security guard, to remind you. And another one at the end of the isthmus (you can see him down there, pacing dutifully). This is because the entire town is a resort. The entire town. I hadn’t actually grasped that part in the guidebook: “an old fishing village that was nationalized in the 1950s and turned into a resort…” The resort was closed, but scheduled to reopen; in the meantime, a township had sprung up onshore, keeping the beaches alive with the gentle buzz of non-corporate tourism. All of which promised to change the moment the resort reopened—so go while you can, I read between the lines. I envisioned a monstrous, skeletal structure with workcrews hanging from cranes, somewhere off to the side of an idyllic pebble beach—an eyesore, but something you could turn your back to. 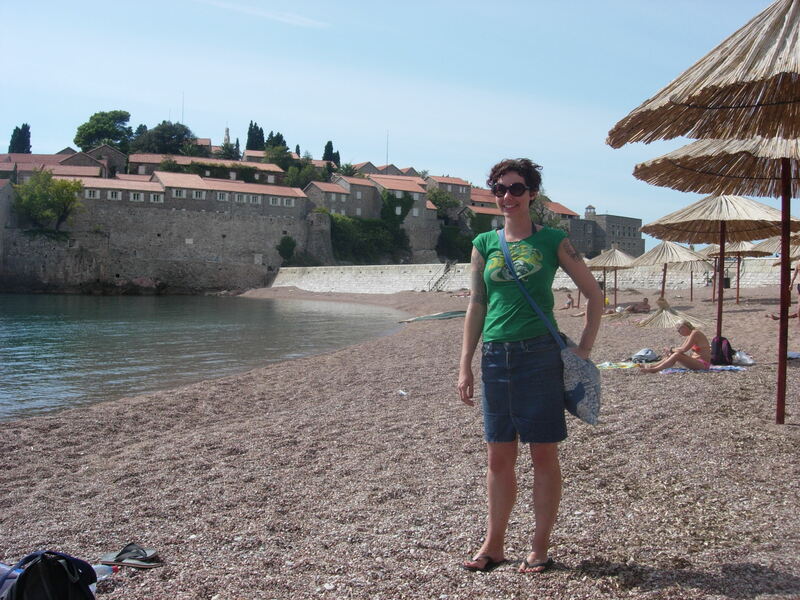 I did not picture the entire island, the remains of a 15th-century village, privatized and closed off to the public. It’s like a modern-day version of a Forbidden Island. But instead of pirates burying the booty, it’s luxury travel mongols. Sitting in the sand, under one of the umbrellas Boris the hotel worker graciously has let you set up camp beneath (hey, it’s October, officially low-season), you feel a little like a grubby kid with their nose pressed up to the glass of some fancy restaurant. It’s a pathetic feeling of alienation—you mean I can’t even walk in there?—that surprises you. You watch a small boatload of people disembark. The gentle breeze carries their posh British accents over your way; you watch them climb the steps in a wave of white scarves and sun hats. They’re greeted by some resort offical and whisked off down the isthmus, a bagpipe player gloriously leading the way. You pick some pebbles off your leg and feel more dejected. There’s a story there, and you know it. 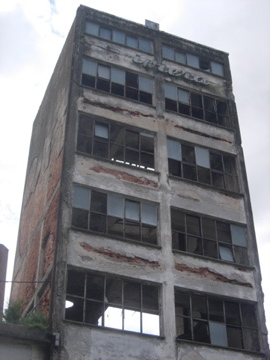 You imagine some 60 years ago, a traditional, working-class town filled with fishermen and their families. You imagine the boats going out in the morning, the nets coming back full in the afternoon; you picture the women in aprons calling from the windows at their children, running down narrow lanes. You picture them all forcibly removed from their homes, uprooted and unearthed after 500 years, and not able to return home. Because wealthy people wanted to work on their sunburns. Such displacement happens in the world, yes, but usually in the name of war, religion, apartheid. But tourism? You wander over to the shady terrace of a fancy cafe for an overpriced espresso. It’s killing you—the story, the story hiding in there, that you can see but can’t get into—so you ask the guy serving you your coffee. He gives you the Disney version. Afterall, he works for the resort. 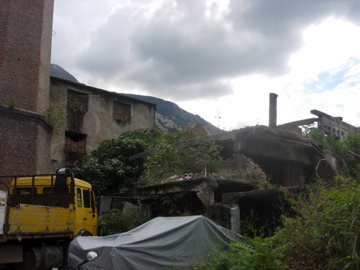 The town’s population had been dwindling, and, in the 50s, the government bought out the last remaining families—15 or 16, who were given “nice pieces of land” in exchange. The town was then turned into a resort—“the only town resort in the world,” he says with a puff of pride—and saw the likes of Hollywood celebrities and European royalty. 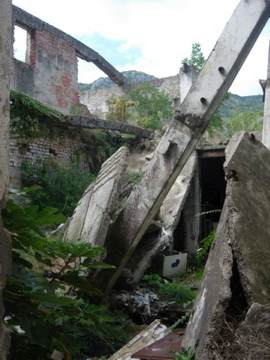 Then, “alas,” during the wars of the 90s, the resort fell into disrepair. But “thankfully,” a German company interveened and purchased the resort. They made a series of exhaustive, tasteful renovations that manage to “retain the Mediterranean charm.” (“It’s really very excellent.”) The resort will officially reopen and accept guests sometime within a year—the British people I saw were probably on a promotional tour. “But, maybe, I don’t know,” the espresso server continues, “you are here for awhile,” shrugs, “maybe I can work some magic, get you a tour.” He sneaks a sidelong glance. The writer in me wants to press. The feminist in me wants to puke. I sit there, instead, and watch the island, the steeple from the old church peeking up above the roofs and the green of its remaining trees. I watch the water nod in white glimmers and think, “Yes, yes, there’s a story there.” If I could just get in, if I could just walk among its buildings, sit on its stones, I might be able to get it, a hint of it—hear what is left, the melancholy echoes that have remained. For a moment I wonder what is worse: that it be preserved, turned into a storybook land that’s accessible to only the fabulously wealthy, where they can indulge their sun-strewn fantasies of a simple life in a long-gone simple world. Or that it turn into a theme-park, another Venice—a soulless caricature of itself. Because, let’s be honest: in this day and age, there’s no way a place as pretty as this would escape the clutches of tourism. But then I come to my senses. An entire island privitized. You’ve got to be kidding me. I lick the last bit of froth from my espresso and watch my pretty, pretty island, sitting forbidden in its lonely paradise. And I think: if I could afford it, would I stay there? 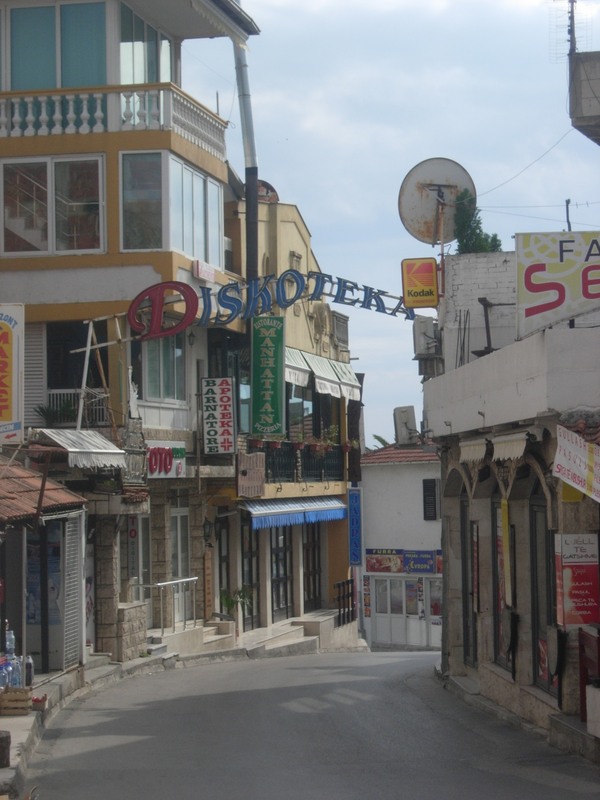 Little town tumbling—orange roofs and white walls, a piercing spire poking through. They huddle there, like that, against the flat glass of water and the great grey of the mountains, rising up, behind their shoulders, like a fanged phantom in an old movie. Little tough guy, maybe 7 or 8, comes buzzing up on his bicycle. Buzzing because the plastic crate fastened to the handlebars has sagged down and is rubbing against the front wheel. He looks at me as he passes, nods at my arm, then stops—skids his worn sneakers on cement—and circles back. He juts his chin at my right arm, an international gesture for “show me your tattoos.” I roll up my sleeve and he smiles. He juts his chin at my other arm, and I repeat. He gives me a broad grin—one molded yellow tooth—and extends his arm in a thumbs up. I smile back with my gleaming row of American white. He nods again, then pushes off, pedals away, is gone. Something of a little girl still in her, something in the smile and the slouch, that behind the grim skin and grey smile, under the coat-hanger bathrobe and shuffle of slippers, seems vulnerable—breakable but not broken. 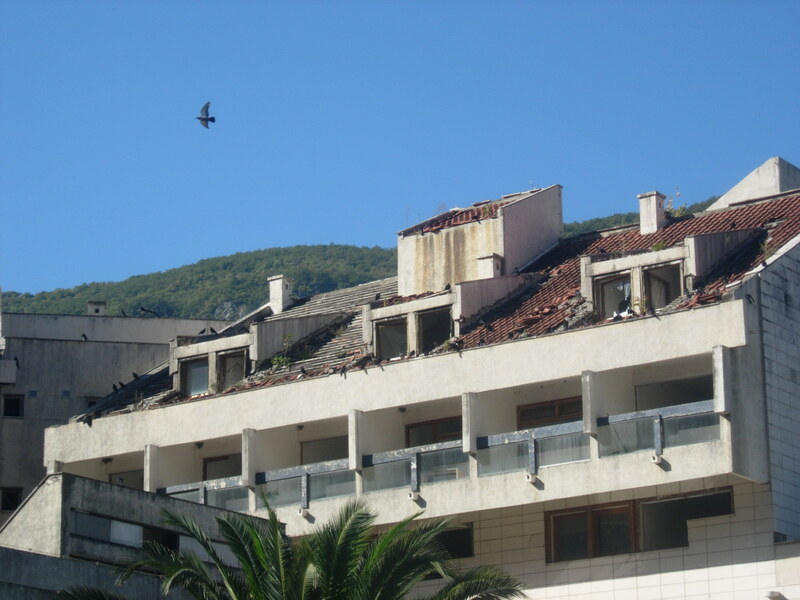 Broken glass and shattered tile, ruins of an old hotel—an exquisite home for the ravens. I like this place better by morning—the umbrellas folded and the stones still wet, the sun a soft thing, haloing from behind the mountains’ immense back. I like the footsteps, the sound of voices, the rattle of stroller wheels. I like the cats in the doorways and the pigeons staring, staring from their stoop between green shutters.